As I mentioned before, this is a short week for me in the office. But it just means I'll be hanging out at home listening to these podcasts instead of at my desk. I've actually got quite a bit of gaming set up for the latter half of the week. Should be a good time. So, as you're waiting for the grill to heat up, let's get you some gaming podcasts. 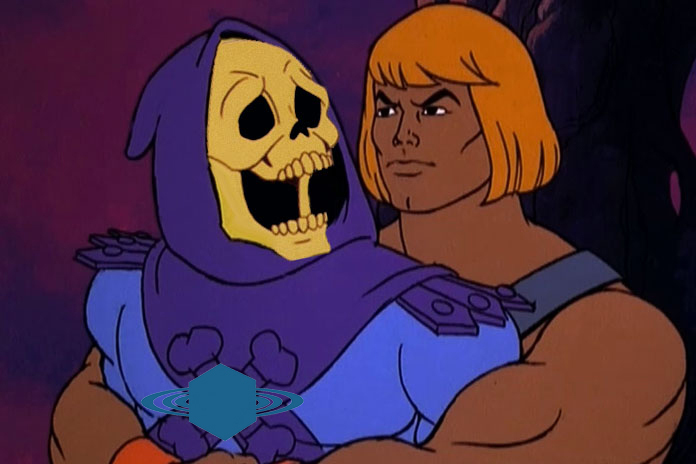 This week on the dial we've got: Game Classy 166: Soul Wars; Blight and Boon Episode 10: Discussing The Slayer Class; Singled Out Episode 70: An Interview With A Perkins Part Deux – sSpigot and vFangtooth; The Polyhedron Collider Cast Episode 44: Back to Reality; Epic Gaming Night Episode 162: Up & Down Time; The D6 Generation Episode 239: Raef's Round Table & Announcement; The D6 Generation Pip 1: WH40K 280+ power point game thoughts; Chance of Gaming Episode 110; Meeples & Miniatures Episode 250: Q&A Extravaganza! ; Playin’ and Slayin’ Episode 18: Origins and Lords of Waterdeep; The Offline Gamer Episode 31: Board Game Bash! ; The Cardboard Herald Episode 86: Jamey Stegmaier - Friendship is Magical in My Little Scythe; The Secret Cabal Express 39: Age of Sigmar Second Edition Discussion and First Impressions; and Rolling Dice & Taking Names Episode 147: Origins 2018, Age of Sigmar Soul Wars, Lorenzo Expansion. It's back into the office for many of us today. Thankfully, it's a short week now until we get back to the weekend. A way to make things go faster is by listening to some gaming podcasts. 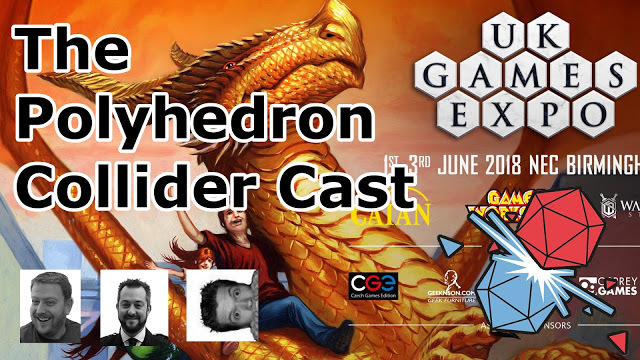 This week on the dial we've got: After Dragons Episode 2: Finding a Group; Chance of Gaming Episode 107; The Polyhedron Collider Cast Episode 42: The UK Games Expo 2018 Preview; Epic Gaming Night Podcast Episode 156: Making the Cut! ; Meeples & Miniatures Episode 248: 7th Continent; The Secret Cabal Express 37: Origins 2018 Pre-Show Fiesta with Rodney Smith and Marty Connell; and The Cardboard Herald Episode 81: Andrew Bosley & Michael Patience of Paisley Board Games. Tuesday. We've made it through Monday. And while the weekend is still pretty far off, it's not as far as it had been. I'm starting to catch up on my sleep from the weekend, but I know it'll still be a bit more of a process. To help keep me awake the rest of the time, I'm gonna listen to some gaming podcasts. Which ones? Glad you asked. 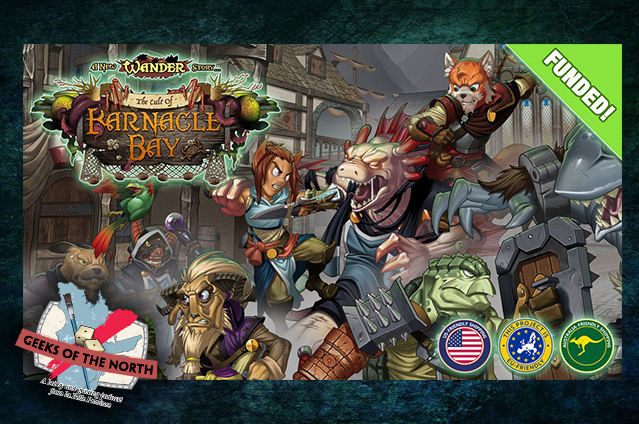 This week on the dial we've got: Guilds of the North Episode 5: Ratcatch those Exiles; The Polyhedron Collider Cast Episode 41: Hard City, Darwin's Choice and Stuffed Fables; Playin’ and Slayin’ Episode 16: Brew City Brawl; The Offline Gamer Episode 29: The (Delayed) 2017 Kickstarter Awards! ; Lords of the Dungeon 15: Good and Evil Mixed Parties and The Economy of Loot; The D6 Generation Episode 236: Video Game Update & Brook City; The Cardboard Herald Episode 79: Kwanchai Moriya Artist Extraordinaire; Singled Out Episode 67: Winning Irish Nationals With Charles Nurser Charles Nurser; Meeples & Miniatures Episode 247: Bag The Hun; Breathing Flames Episode 1: Games Are Great; SAGA THORSDAY Episode 88: Why do I play Saga? ; and SAGA THORSDAY Episode 89: Battle Report – Last Romans vs Vikings – Battle for the Gardens. Monday is gone and we're firmly entrenched in Tuesday. The work week continues along as we make our way back to the glory of the weekend. If you're like me, you fill up as much of your day with gaming as you can. To help with that, as we do every week, we've collected together the podcasts and present them here for you now. On the dial today: Geeks of the North Episode 44: Adepticon 2018; Guild Ball Tonight Episode 81: You're Not Wrong; The Secret Cabal Express 37: Having and Managing a Game Collection; Dungeon Masters Ludus 04: Just Starting Out As A Game Master; Chance of Gaming Episode 105; Singled Out Episode 66: Talking Season 3 Butchers With Greg Day; Blight and Boon Episode 7: Rangosh and Lorsain Double Team; Meeples & Miniatures Episode 246: Burrows & Badgers; The Polyhedron Collider Cast Episode 40: Vadoran Gardens, Rise to Nobility and Dungeons and Dragons; Nerdherders Episode 25 (115): It All Adds Up to Adepticon! ; Epic Gaming Night Podcast Episode 153: Marvel Madness! ; The Offline Gamer Podcast Episode 28: We're Back! ; Blue Peg, Pink Peg Episode 121: Heroes of Land, Air & Sea; The Cardboard Herald Episode 77: Samuel Bailey, co-designer of Forbidden Stars & Designer of the recently cancelled Deep; SAGA THORSDAY Episode 87 – Skraelings and Milites Christi Battleboard and Tactics Pt 2; and News of the North - 2018-05-01. Welcome back to Tuesday. We've got the work-week off and running, so let's hit our full stride and keep things going until we get back to the weekend. To help out, we've got our regular batch of podcasts for you to listen to, you know, instead of Nina in corporate accounts (payable). This week we have: Chance of Gaming Episode 104; Blight and Boon Episode 5: Champion Background and Backstory; Singled Out Episode 65: Talking Exiles With Jamie Perkins; Epic Gaming Night Podcast Episode 151: Crystal Clans with Colby Dauch; Meeples & Miniatures Episode 245: Stand To Games; Guild Ball Tonight Episode 80: Hey Phil; Playin’ and Slayin’ Episode 15: Game Movies and Gaslands; Lords of the Dungeon Episode 14: End of the World Followup, GMs Playing Characters and Great Villains in RPGs; Cardboard Herald Episode 75: Carla Kopp of Weird Giraffe Games ROUND 2! ; SAGA THORSDAY Episode 85: Battle Report – Scots vs Anglo-Danes; and News of the North - 2018-04-17. I'm glad it's here. My Monday wasn't the best. Much of the day, I had a headache. Hell, I even managed to wear the wrong shirt (I had my Tuesday shirt on under my Monday overshirt. So, today, I'm reversed of that). So, let's make sure you've got something good to listen to the rest of the week with our Podcast Roundup. 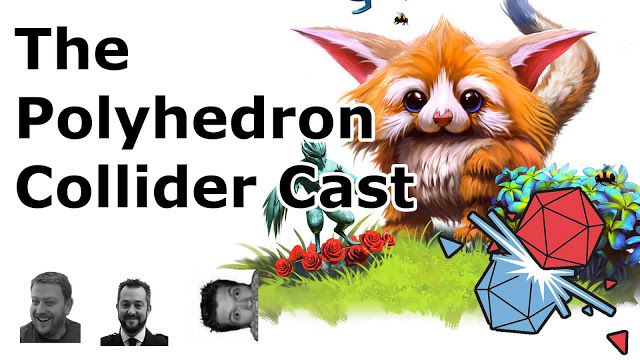 This week we have: Game Classy 156: Warhammer Underworlds: Eternia; Man Battlestations Episode 27; Meeples & Miniatures Episode 241: Baccus 6mm; Polyhedron Collider Podcast Episode 37: Fallout, Kitchen Rush and Ethnos; Epic Gaming Night Podcast Episode 44: The Cost of Gaming; Nerdherders Episode 23 (113): The 2017 Retrospective Extravaganza! 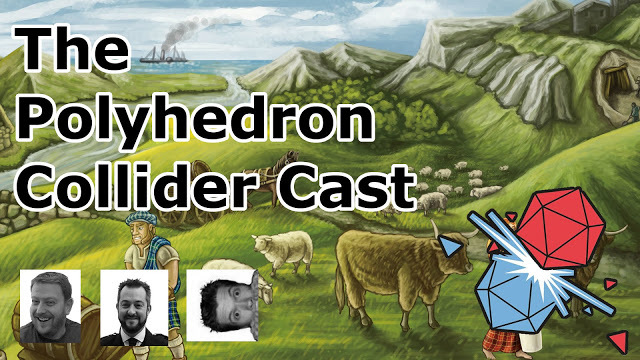 ; The Cardboard Herald Episode 66: Jackson Pope of Eurydice Games; The Secret Cabal Episode 152: Merlin, City of Iron, DOOM and a Short Topic Extravaganza; SAGA THORSDAY Episode 76: Mutatawwi’a Battleboard and Tactics Pt 2; and Blue Peg, Pink Peg Episode 116: Raiders of the North Sea & Expansions. 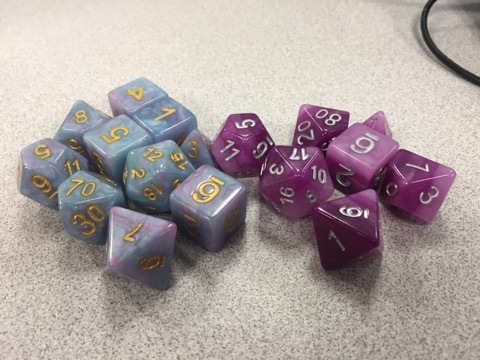 Here's to hoping that your week is starting off well (I got new dice yesterday! #NoSuchThingAsTooManyDice). We've made it through the first day, hopefully the rest will go by smoothly. I know to help me get along, I'll listen to some gaming podcasts. Yes, as much as I hear about gaming stuff all day here in the office, there's always more I can listen to. That's just how I am. This week we have: Meeples & Miniatures Episode 240: Fourth Quarter Football; Singled Out Episode 58: Talking Godtear With Sherwin; Nerdherders Episode 22 (112): Campaign Advisors; Masters of the Forge: Altar of War Episode 7: Daemons Codex Preview; The Cardboard Herald Episode 63: Chuck Pint of SFR Inc, the makers of Dragon Dice! ; The Secret Cabal Episode 151: The Expanse and Randomness in Gaming; SAGA THORSDAY Episode 73: Crusaders Battleboard and Tactics Pt 1; The Rolistes Episode 26 (Part 1): Dragonmeet 2017, Return to the #PodcastZone; Playin’ and Slayin’ Episode 11: 2018 Goals; Plan of ATK! Episode 18; and News of the North - 2018-01-23. So, while I still have full use of my appendages, let me get you some podcasts to listen to for this first week of the year. 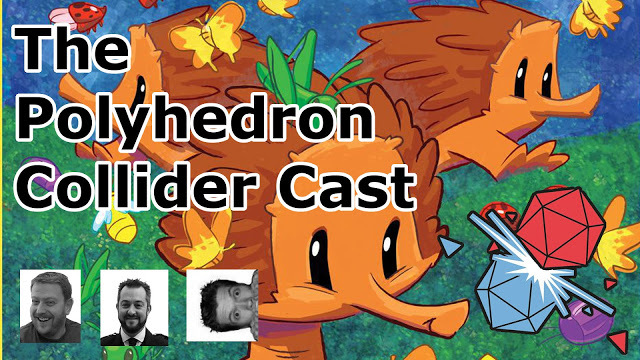 We've got: Game Classy 153: Nurglebois; Meeples & Miniatures Episode 238: Bad Squiddo Games & Freya’s Wrath; Drive Thru FM #10: Best Games of 2017; The Polyhedron Collider Cast Episode 35: The Best Games We Played in 2017; SAGA THORSDAY Episode 70: Saga 2.0 Chat and Contest Winner; The Cardboard Herald Episode 60: Our Favorite Gaming Memories ft. Jamey Stemaier, Jerry Hawthorne, Bruno Cathala & more; and The D6 Generation Episode 228: Battlefoam Update & Company of Iron Detailed Review. I hope everyone out there had a good Christmas. With any luck, you got some new games and models. For those really fortunate, you've maybe got this week off. So while you're assembling those figures and reading those rulebooks over, let's give you some gaming podcasts to listen to as well. Or, if you are headed back to work, you don't have to still hear holiday music, even though that's passed. This week we have: Nerdherders Episode 21 (111): Game Boys; Exploding Dice Radio Episode 8; Meeples & Miniatures Episode 237: Crooked Dice; Epic Gaming Night Episode 137: Top 10 games of 2017! 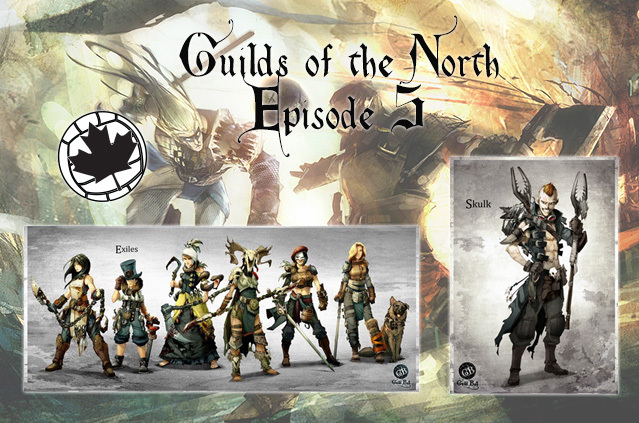 ; Guild Ball Tonight Episode 73: The Phil Rule; Rolling Dice & Taking Names Episode 134: 5th Anniversary Show, Pie Town, and Fog of Love; The Cardboard Herald Episode 59: PAX Minis Wrap-up; The Secret Cabal Episode 149: Aristeia, Inis, 2017 Year in Review and our Favorite Games of 2017; SAGA THORSDAY 69: Strathclyde Welsh Giveaway; and The D6 Generation Episode 227: Annual Predictions Episode. It's the Tuesday after a very long weekend. I think it's the day that actually feels like Monday. The actual Monday was some crazy thing that threw us from our homes back into the working world. I know I had a ton of stuff to catch up on yesterday. Some of it's spilling over today. So I need to make sure I get things done. Having some gaming podcasts going on while I work will help. This week we have: Meeples & Miniatures Episode 235: Gaslands; Epic Gaming Night Podcast Episode 133: Gaming Unplugged; Singled Out Episode 53: Talking SteamCon 2017 with Mat Hart; 40K Radio Episode 24: Talkin’ Tyranids; Guild Ball Tonight Episode 70: Minor Guilds, How do they Work? ; Rolling Dice & Taking Names Episode 132: Bastion, Sidereal Confluence, Necromunda, Fate of the Elder Gods, and Samurai Gardener; The Cardboard Herald Episode 55: Christopher Davis of Windborn Games; Gaming on Tap Episode 06: Samuel Adams / Top 3 Games We're Most Thankful For; Plain' and Slayin' Episode 9: Playin’ and Slayin’ – Gaming Cornucopia; SAGA THORSDAY Episode 65: Byzantines Battleboard and Tactics Pt 2; The D6 Generation Episode 225: Captain Con Update, Santorini & Bunny Kingdoms Reviews; and News of the North - 2017-11-28. Tuesday. I know that Arthur could never get a handle on Thursdays. I feel that way about Tuesday. Sure, the week's well and started, but it's like Monday 2: Mon Harder. Not that I think it's particularly as bad as Monday, but still, it's a really long way from the weekend. Gotta make it get here as soon as possible, and some gaming podcasts can hopefully help with that. This week we've got: Man Battlestations Episode 24; Meeples & Miniatures Episode 234: For King And Parliament; Singled Out Episode 51: Sculpting Guild Ball With Russ Charles; Singled Out Episode 52: Talking Rookies With Jamie Perkins and Bryce; Epic Gaming Night Episode 131: War Gaming; Drive Thru FM Episode 8: The Necromunda Interview; Rolling Dice & Taking Names Episode 131: Gentes, BooBQ, and Jack Vasel Auction; The Cardboard Herald Episode 53: Roberto Di Meglio of Ares Games, Co-Designer of War of the Ring; Lords of the Dungeon 9: Super Villain Campaigns and Getting Players Invested; SAGA THORSDAY Episode 63: Franks Battleboard and Tactics Pt 2; Gaming on Tap Episode 05: Killer Green / Above and Below; The Offline Gamer Episode 26: Sorry about that...; and News of the North - 2017-11-14. Happy Halloween, everyone! I'm actually in costume, though you can't see it. I'm dressed up as "me on Saturday." Hey, having a set wardrobe for particular days of the week means that putting on a costume is as simple as changing which day I wear which shirts. Though it does make me feel like I should be typing up the Review Roundup and not the Podcast one. Yet Tuesday it is. And that means podcasts. 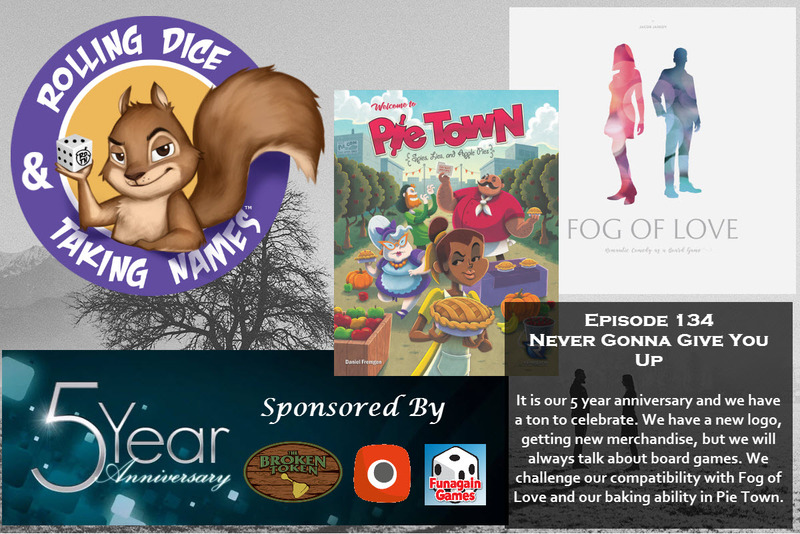 Today we have: Meeples & Miniatures Episode 233: Oppy Wood; Anonymous Tabletop Episode 19: Tales from the Unscript; Forgot My Dice Episode 22 (29): Count of Monte Cristo Moment; The Secret Cabal Express 32: Hosting a Halloween Game Night; Epic Gaming Night Podcast Episode 129: Lets Get Spooky! ; SAGA THORSDAY Episode 61: Franks Overview; The Cardboard Herald Episode 51: Kenna Conklin of Going Last; Rolling Dice & Taking Names Episode 130: Richard the Lionheart, Sundae Split, Alien Artifacts and Ted Alspach; Singled Out Episode 50: Talking Tournament Bridesmaids With Jason Mountain; and News of the North - 2017-10-31. We're firmly on our way into the new work week. And, of course, I'm looking forward to the weekend. The past couple have been pretty busy, so I think I'm gonna take it easy this upcoming Saturday. Might still get some gaming in, though. We'll see. But before that, we need to actually get to the weekend. To help the time go by, here's some gaming podcasts for you to listen to. This week we have: Man Battlestations Episode 23; Meeples & Miniatures Episode 232: Imperial Assault; Epic Gaming Night Podcast Episode 127: Top 10 Must own Games! ; Drive Thru FM Episode 7: #SHUX, MegaGames, and Essen; The Rolistes Episode 22 (Part 4): The Rolistes Go To The UK Games Expo; The Polyhedron Collider Cast Episode 32: Clans of Caledonia, Monster Lands, Inbetween and our Essen; Exploding Dice Radio Episode 7; The Cardboard Herald Episode 49: Michael Coe's tiny epic return to TCbH; Playin’ and Slayin’ Episode 8: Saving Games; SAGA THORSDAY Episode 59: Saga Storm 2017; and Lords of the Dungeon Episode 8: Selecting an Appropriate RPG System and The Fate Core System. The work week is firmly underway. I know I like to have some sounds going on beside the random clacking of keyboard keys and the conversations coming from the other offices. That's why I keep my regular list of gaming podcasts (as well as several groomed Pandora stations). Seeing as it is Tuesday, that means sharing a new crop of podcasts with you to hopefully make your week go by smoothly. This week we have: The D6 Generation Episode 222: Stronghold Games Update & Who's Character is it Anyway? ; Guild Ball Tonight: A Status Update from Phil; Singled Out Episode 48: Talking Union In Chains With Sherwin; SAGA THORSDAY Episode 57: 1 Year of Saga Thorsday; The Secret Cabal Express 31: The Joy of Warhammer 40,000; The Cardboard Herald Episode 47: Kathleen Donahue of Labyrinth Games & Puzzles; Rolling Dice & Taking Names Podcast Episode 128: 7th Continent, Professor Evil & the Citadel of Time, Codenames: Duet, Shadespire; Epic Gaming Night Podcast Episode 125: Game Protector! 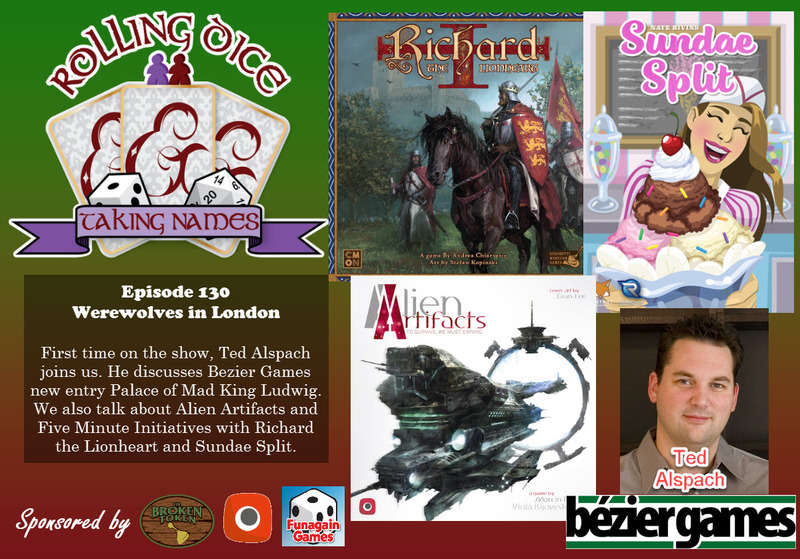 ; Forgot My Dice Episode 27: Things Start Exploding With Loot; and Meeples & Miniatures Episode 231: Time of Legends: Joan of Arc. The work week continues on. We've made it through Monday and are firmly entrenched in Tuesday. If you're like me, you're looking forward to that next weekend. I find that listening to gaming podcasts helps out with that. And that's just what we've got for you here. 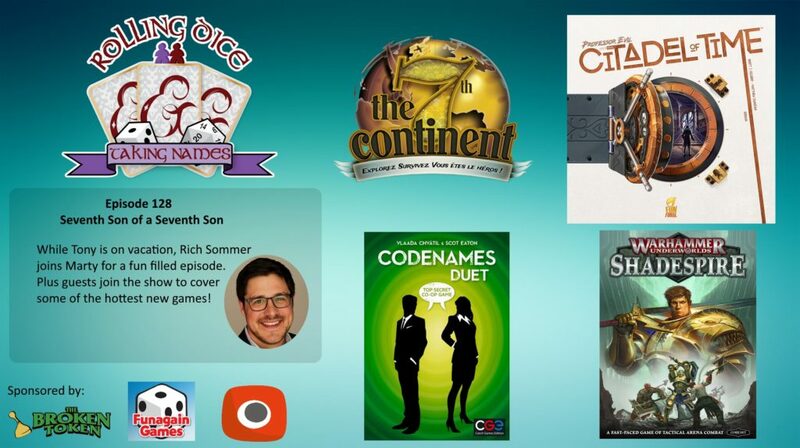 This week there's: Game Classy 145: Lovecraft Country Music; Gaming On Tap Episode 02: 3Mag Rain / Lords of Waterdeep; Meeples & Miniatures Episode 230: Ground Zero Games; Epic Gaming Night Episode 124: Patron Hang Out; The Rolistes Episode 22 (Part 3): The Rolistes Go To The UK Games Expo; The Cardboard Herald Episode 46: Aron West of Elzra Games - Master of the Catacombs; The D6 Generation Episode 221: Tableware GEO Mat & Dragonfire Detailed Review; The Secret Cabal Episode 143: Massive Darkness, Mansions of Madness Second Edition and Nostalgia in Board Games; Plan of ATK! Episode 11; SAGA THORSDAY 56: Saga Second Edition; The Offline Gamer Podcast Episode 25: Two Years; Singled Out Episode 47: Playing A Guild For The First Time; Blue Peg, Pink Peg Episode 107: Ex Libris; and News of the North - 2017-09-26. It's back to Tuesday we go. The Work Week will be conquered and we will make it back to the weekend. And a good way to help out with that is by listening to some gaming podcasts. Put one on, and before you know it, you've got some great gaming information as well as several hours have gone by. It's a win-win. 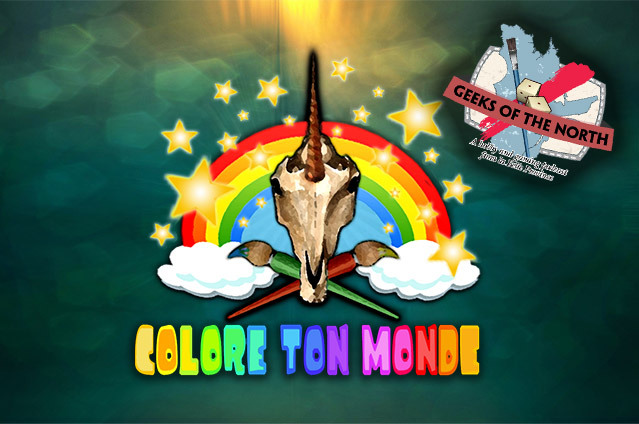 This week we have: Geeks of the North Episode 42: Wander: The Cult of Barnacle Bay; Playin’ and Slayin’ Episode 7: Gen Con 50; 40k Radio Episode 22: Talkin’ Tables; Meeples & Miniatures Episode 229: The Godfather: Corleone’s Empire; Singled Out Episode 46a: Bonus Episode: Same 6, Different Day; The Polyhedron Collider Cast Episode 31: Wreck & Ruin, This War of Mine and reviewing board games; Epic Gaming Night Podcast Episode 123: Top 10 Space Games; The Cardboard Herald Episode 45: Morten Monrad Pedersen of the Automa Factory; SAGA THORSDAY Episode 55: Rus Princes Warband; The Secret Cabal Express 30: The Further Evolving Board Game Industry and Community with Rodney Smith; and News of the North - 2017-09-19. It's Tuesday here in Atlanta. Thankfully, the city doesn't seem to have been hit too hard by the storm. Hopefully all of you are safe and with power. I'm black in the office and looking to get back to a normal routine. That includes loading up some gaming podcasts to help make our way back to the weekend. 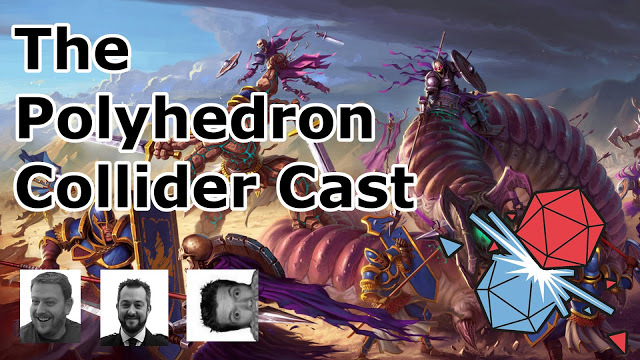 This week we have: Game Classy Episode 145: All in on Age of Sigmar; Guilds of the North Episode 3: Guild Identity Cards; Pride of the Legion Episode 2; Cheated Fates Radio Episode 6: Then There Were Three; Nerdherders Episode 19 (109): Putting Out The GenCon Welcome Matt; Forgot My Dice Episode 19(26): The Psychological Impact of Permanence; Epic Gaming Night Podcast Episode 122: Family Time! ; The Cardboard Herald Episode 44: David Somerville: co-designer of Vast: The Crystal Caverns; Lords of the Dungeon Episode 6: Overcoming GM Anxiety; Plan of ATK! 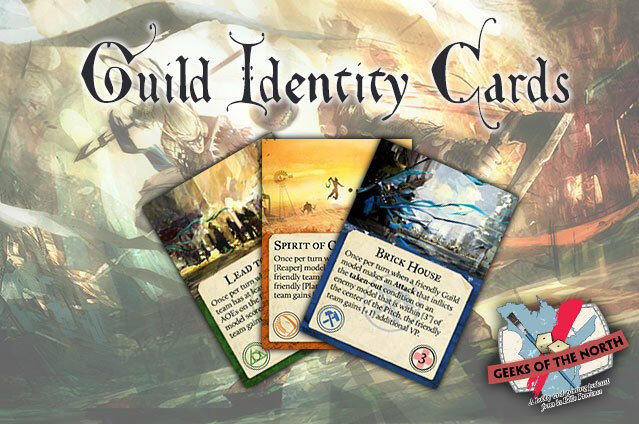 Episode 10; Singled Out Episode 46: Talking Guild Identities with Jamie Perkins; SAGA THORSDAY Episode 54: Battle Report – Anglo-Danes vs Vikings; Meeples & Miniatures Episode 228: Whatever happened to Ambush Alley Games? ; Blue Peg, Pink Peg Episode 106: Lorenzo il Magnifico; Rolling Dice & Taking Names Episode 127: Interview Ignacy about Portal’s Alien Artifacts, Review Nmbr 9, Dragonfire, Hafid’s Grand Bazaar; and News of the North - 2017-09-12. I've always preferred Mondays off to Fridays. I mean, sure, you still get a 3-day weekend either way. But, with a Monday off, it's a long weekend and then a short week. I like that more than a long weekend and then a regular week. You're already 1/5 closer to having some time off again. And to help things speed along even more, there's gaming podcasts to listen to. This week we have: Man Battlestatsions Podcast Episode 22; Singled Out Episode 45: Talking Guild Identities; Meeples & Miniatures Episode 227: Firestorm Games; Epic Gaming Night Podcast Episode 121: Totality! 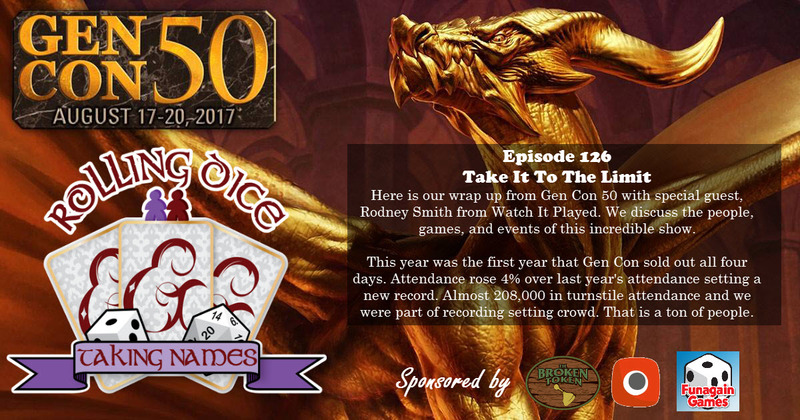 ; Rolling Dice & Taking Names Episode 126: Gen Con 50 with special guest host, Rodney Smith from Watch It Played! ; The Cardboard Herald Episode 43: Isaac Vega - Designer & Plaid Hat Games VP of Research and Design; The Secret Cabal Episode 142: Fate of the Elder Gods, Cry Havoc, Gen Con 2017 Post-Show and a Short Topic Extravaganza; SAGA THORSDAY 53: UK Northern Melee; and The D6 Generation Episode 220: Gen Con 50, Company of Iron Interview, & Play by Mob 2017. It's Tuesday. The work week is well underway. Hopefully yours is going well. There's lots going on this upcoming weekend, what with NOVA Open as well as Dragon*Con, so I'm sure many of you are wanting the time to go by as fast as possible. Heck, you might just be looking forward to a 3-day weekend at the lake or something (those of us in North America who have a 3-day weekend coming up, that is). Well, to help the time go by, here's some podcasts to listen to. This week we have: Game Classy 144: Gen Con! ; Guilds of the North Episode 2: Blacksmiths and Lucky; Pride of the Legion Episode 1; Forgot My Dice Episode 18(25): You Shall Not Pass; The Rolistes Episode 23: Two Years Strong at the Barbican; Guild Ball Tonight Episode 66: Get Your Kicks; Guild Ball Tonight Episode 67: I'll Still Paint Them; Epic Gaming Night Podcast Episode 120: Gencon 50 with Mark Streed! ; Meeples & Miniatures Episode 226: GenCon 50 musings; The Cardboard Herald Episode 42: Jon Moffat & Gary Mosman of Stone Circle Games; Blue Peg, Pink Peg Episode 105: GenCon 2017; SAGA THORSDAY Episode 52: Norse-gael Battleboard and Tactics Pt 2; The Secret Cabal Express 29: Our Favorite Things and Games That Do Them Well; and News of the North - 2017-08-29. So, you've got your reviews. Let's move on to Podcasts. I'm sure many of you are going to be in a bit of a haze after the week that was Gen Con. So as you drag yourself back to the office and have to once more get into the swing of the office scene, here's some podcasts to help you make the work week go by a bit quicker, and give you some "hair of the dog" in terms of gaming. Today we have: SAGA THORSDAY Episode 51: Norse-gael Battleboard and Tactics Pt 1; The Offline Gamer Episode 24: Ninja Ghost Cat; The D6 Generation Episode 219: Wayland, Warcradle, WWX, & Mulling Luck Mitigation Mechanics; The Cardboard Herald Episode 41: Anson Maddocks, Classic Magic: the Gathering Artist; Rolling Dice & Taking Names Episode 125: Clank! in Space, Terraforming Mars Expansion, and The Climbers; Meeples & Miniatures Episode 225: Rommel; Singled Out Episode 43: Playing The Blacksmiths 6; Singled Out Episode 44: Guild Ball British Championships 2017; 40K Radio Episode 21: The Helsreach Interview; and Anonymous Tabletop Episode 17: Pros and Cons. This week we have: Game Classy 143: Top sellers from a couple months ago! ; Meeples & Miniatures Episode 224: Forager; Epic Gaming Night Podcast Episode 118: Gencon Preview! ; The Cardboard Herald Episode 40: Dr. Gordon Hamilton, designer of Santorini; SAGA THORSDAY Episode 50: Battle Report – Anglo-Danes vs Jomsvikings; and Plan of ATK! Episode 9. Yesterday seemed to go by quick. Being busy will do that. And there's very little time of year that I'm busier than the weeks leading up to Gen Con. So, while everything I'm doing is revolving around gaming right now (even moreso than usual), there's still some room for more, such as gaming podcasts. This week we have: Man Battlestations Podcast Episode 21; SAGA THORSDAY Episode 49: Swedish Spotlight; Mantic Radio Episode 12; The Secret Cabal's The Gen Con 2017 Pre-Show Spectacular; The Secret Cabal Episode 140: The Godfather Corleone’s Empire, Mare Nostrum Empires and The Secret Cabal Playlists; Epic Gaming Night Podcast Episode 117: Miniature Madness! 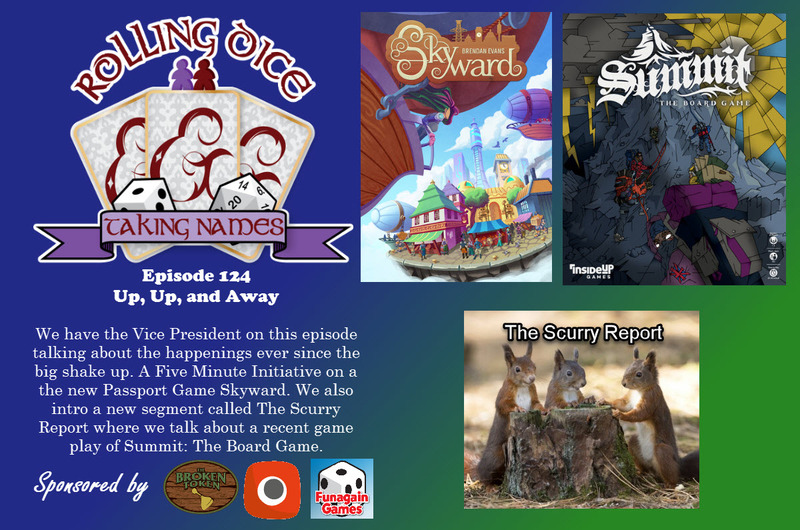 ; Singled Out Episode 42: Newbie Mistakes 3; Rolling Dice & Taking Names Episode 124: Summit – The Board Game, Skyward, Isaac Vega, and The Scurry Report; The Cardboard Herald Episode 39: Andrew Birkett of Atheris Games at Dice Tower Con; Blue Peg, Pink Peg Episode 104: Sentient and GenCon 2017 Preview; Meeples & Miniatures Episode 223: Sword & Spear Fantasy; and News of the North - 2017-08-08. Monday is done and Tuesday is well underway. We're also at the start of a new month. August is a big deal for many of us gamers, as it means Gen Con. I know I want it to get here. Perhaps listening to some gaming podcasts will help time speed by so we can get to Indy. Can't hurt, anyway. 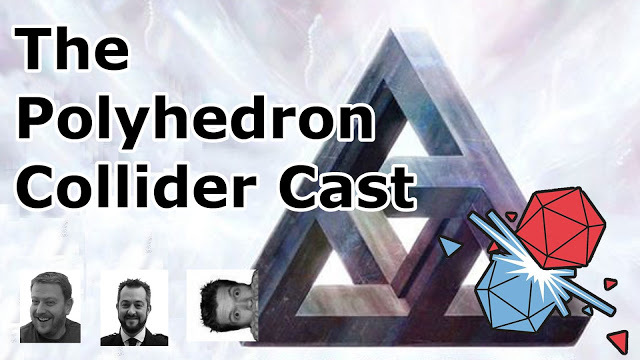 This week we have: Game Classy Episode 142: Do it for the Ur-Gold; The Polyhedron Collider Cast Episode 29: Runewars Miniatures Game, This War of Mine and Cave In; Exploding Dice Radio Episode 5; 40K Radio Episode 20: Honour Thy Chapter! ; Forgot My Dice Episode 16 (23): Slammer and the Beard; Cheated Fates Radio Episode 5: Ultimate Team Showdown 2017 Recap; Epic Gaming Night Podcast Episode 116: The First Game; Singled Out Episode 41: Talking Errata With DC; The Cardboard Herald Episode 38: Stephen Buonocore of Stronghold Games; Plan of ATK! Episode 8; The D6 Generation Episode 218: Dog Might Games & Gamer Bling; SAGA THORSDAY Episode 48: Jomsviking Warband; Guild Ball Tonight Episode 65: Ch Ch Ch Ch Changes; and Meeples & Miniatures Episode 222: Carnevale.